Just wondering what people experiences are with methods of euthanasia? I thought there was a thread but i cant seem to find one. I did ask the vet why it was different and she said it varies depending on what method each vet prefers. I know the heart one can hurt if they arent anaesthetised but she assured me he wouldnt feel anything. It's likely to be the same chemical, but different brands use different colouring (it's whacky coloured to minimise mixup risks). My vets usually use a brand which uses pink colouring. I personally prefer the injection to be given to the heart as it's quicker - sometimes gas anaesthetic can wear off super quickly once they're no longer directly receiving (if gas anaesthetic is being used the rat can be returned after the final injection if so, but there's still a gap). However accessing a rat heart requires significantly more skill, and small individual physiological differences can make this harder. Sometimes vets won't get placement bang on on the first attempt, so some vets prefer to inject elsewhere, where such precision isn't required (especially if the owner who may get upset is watching). Either way, you're totally within your rights to discuss the details with the vet in question before it happens - same as with any other procedure! I think my worry with the heart injection is, if the anaesthetic does start to wear off before its taken effect (she did have to go and get some more of the injection and the first injection didnt do it) then he would feel it and it would be a horrible way to go, whereas with the abdomen if the anaesthetic wears off i assume the they dont actually feel the meds taking effect and once its in there system its as pain free as it is for cats and dogs? Luckily it did go fine, she did have to have a few attempts to get the needle in, but that itself didnt worry me, he was asleep and blissfully unaware of being prodded by the needle, I can imagine it would of been extremely distressing if he had started to wake up tho!. All of the rats I've had euthanised are injected straight into the heart. My vets puts them under first. Admittedly, it was not something I'd ever thought about (all I knew was that they were put under anaesthetic before the injection), it was only when I had a hairless girl pts that I noticed the where the injection has been put in. After spending night over thinking the whole situation, I think its possibly for the Vet who performed the euthanasia that i wasnt comfortable with rather than the method used itself. Ive emailed the practice to see who she was so I can request to be seen by someone else for future euthanasia's as the whole process from start to finish was a little bit rushed and lacking any form of reassurance. In fact I can imagine that for someone who wasnt familiar with the euthanasia process it could of been quite distressing! All the usual Vets at my practice are usually so lovely and really take there time to reassure you and talk you through things so I dont know where this woman has popped up from but the more I think about it the more i deffinatley dont want to see her again! That does sound very rushed, and not great in manner at a sensitive time. I've turned up to my current practice a couple of times for an emergency pts (when they've had like one vet on doing small animals and a full appointments list) and at the most the vet has vanished quickly afterwards - but leaving me with a nurse to take things at my own pace. I've had much less good experiences elsewhere. I think finding out her name and then avoiding is a good plan now that you've worked your feelings out. That doesn't sound very nice indeed. My vets even take time for me despite having a lot of rats and thus putting one to sleep pretty often, even when I come after closing hours for an emergency euth they take their time with me and are very nice. For us owners a large part about euthanisation feeling right depends on how the vet treats you. I do want to note that an injection straight into the heart without anesthesia is illegal, at least it is in the Netherlands and IIRC the British laws are pretty similar. It's not humane in any case. With anesthesia (gas or injection in the muscle) it is legal and humane and indeed the quickest way to euthanise. If you want to go with a single shot go for the abdomen, though honestly I am not too happy with how vets tend to give these injections (there's a specific way to it so you don't hit and rupture any organs, can't imagine that feeling nice). An IC injection without anaesthesia is legal here but most vets don't do it. I've had several rats take over 20mins for the heart to stop if the injection is just into the abdomen. One did start to come round to and had to have more sevoflo. There can be quite a lot of blood leakage with an IC injection and it can be difficult as vets on the whole don't do it often. She doesn't sound very compassionate, I'm sorry she made an unpleasant time even worse. I wouldn't want to see her again either. 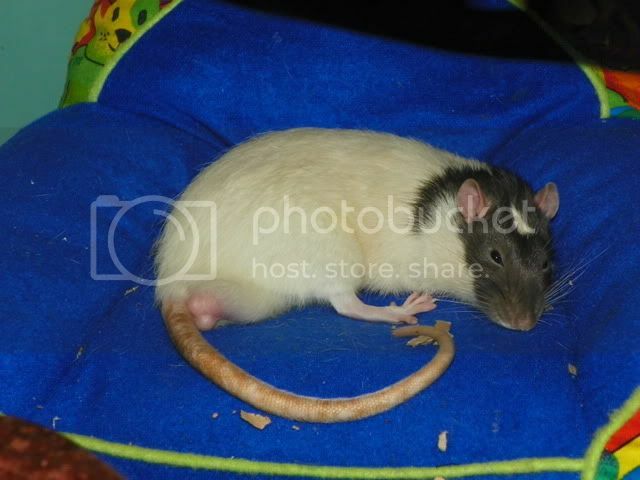 RedFraggle wrote: I've had several rats take over 20mins for the heart to stop if the injection is just into the abdomen. One did start to come round to and had to have more sevoflo. When that happens usually the injection did not go correctly and probably went somewhere else like in the abdominal fat or intestines. Like I said vets are often not very good with these injections either as they tend to just hold up the rat's upper body and poke straight into their abdomen. Sorry, a bit TMI but I care a lot about proper euthanisation and I happen to have been thought how to do it properly during my study. I agree IC injections are also quite difficult without experience. Indeed, that's why I said it happens with an abdo injection sometimes. Some would find it pretty upsetting. In my opinion the most proficient are trained animal lab techs. I've seen plenty of IC injections done perfectly in conscious rats with no obvious stress or trauma to the rat. If I had the choice of a vet or a licenced tech I'd take the tech any day of the week! I once had a horrible old dinosaur of a vet inject my rat straight into the heart without anaesthetic. He screamed and I have never forgotten it, or been back there. I wish I had complained. I have to say reading your experience, I would definitely not be happy about this. The vet technically performed the procedure as necessary but I don't think that's really the way they should behave when people have come there to say goodbye to their beloved pets. Compassion, sensitivity, sympathy is part of the job description, doesn't sound like she had any. I am appalled and saddened that your rat received a lethal injection without sedation. This is inhumane and extremely painful. How a vet could end an animal's life this way who is already suffering is beyond my comprehension. How does he/she sleep at night? One of my rats had to be euthanized and my vet chose to sedate first with an injection. At that time I didn't know how sedated my girl would be and I looked at my vet and told him I was not going to have my rat die this way and asked for isoflurane sedation. He grudgingly obliged and told me to put my rat in the tank (with no towel) and did the deed and gave my rat back to me. I have not read other replies to avoid influencing what I was going to post. All I can say is NEVER allow a rat to be PTS without sedation. I am quite new in rat keeping, some of these ways of euthanizing our beautiful animals are so scary. I really hope i dont get to have to choose any of the ways because its gonna break my heart.